James Bay and Julia Michaels are set to release the duet 'Peer Pressure'. The 'Hold Back The River' hitmaker surprised fans on Tuesday (19.02.19) by sharing a snippet of his collaboration with the 25-year-old pop star, which is released on Friday (22.02.19). James sings on the track: "Seven texts, 2 a.m./ Halfway dressed/ They're all saying call me up/ You can't sleep/ You're testing me/ Bad but sweet/ And I'm just trying to keep it together." The 28-year-old musician also shared a picture with Julia on his social media accounts and added the caption: "This Friday! New song featuring my friend @juliamichaels x (sic)"
The track acts as the first new music from the British singer/songwriter since his 2018 album 'Electric Light'. Julia released the EP, 'Inner Monologue Part I', featuring Selena Gomez on 'Anxiety' and Niall Horan on 'What A Time' last month. 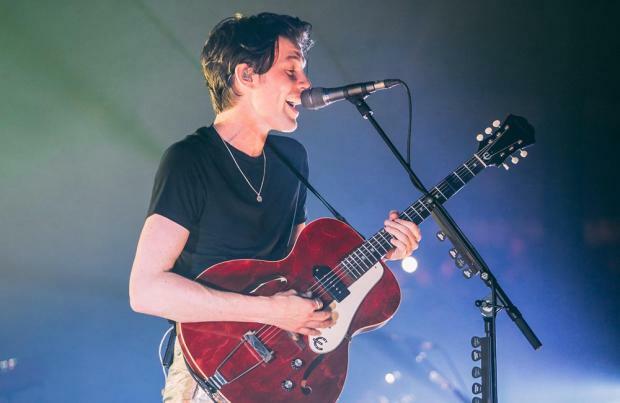 It's no surprise James has branched out with the collaboration, as he previously revealed his second album – which is noticeably different to his guitar-led debut LP 'The Chaos and The Calm' – was inspired by the music of pop stars Ed Sheeran and Taylor Swift. James said previously: "Ed and Taylor have almost treated each release like they're trying to break themselves again as an artist on the world's stage. "So I'm treating this like that. Not just because I've lived this for a while now, and I'm still living it, and that feels like the smartest move." James appears to be working hard on new music for his third album as he often takes to social media to share pictures from his trips to the US and videos of him playing guitar. Meanwhile, James will be supporting Ed on the European leg of his tour along with Zara Larsson and The Darkness. The run kicks off with three consecutive nights in Lyon, France, on May 24.